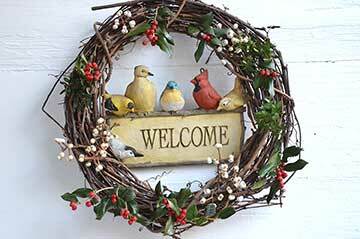 Whether indoors or out, nature abides a welcome guest in every part of these homes during the holiday season. Come late November, those who crave an old-fashioned Christmas begin thinking of gathering nature's best winter offerings for decking the halls - and the porch and the pump house and anything else that can show off holiday greenery. For three Midlands-area homes, only the real thing will do, and each December brings their owners a fresh vision for arranging seasonal finds. Their sources? Woods, field, yard and garden. When holiday visitors pull into the grassy parking area behind Hunterfield, the farm home of Nancy and Rodney Lee of Ridgeway, one of the first things that captures the eye is Nancy Lee's potting shed. Formerly the pump house and quaintly charming in any season, when it puts on its Christmas dress the diminutive structure especially pleases. 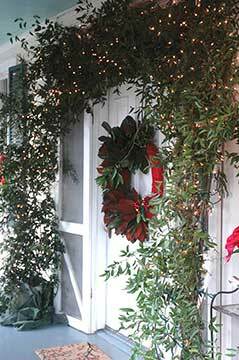 Nancy has created a wreath for its white-painted wooden door from berries accented by smilax and Fraser fir. The bright red berries compose a cheerful harmony with the darker red tin roof. 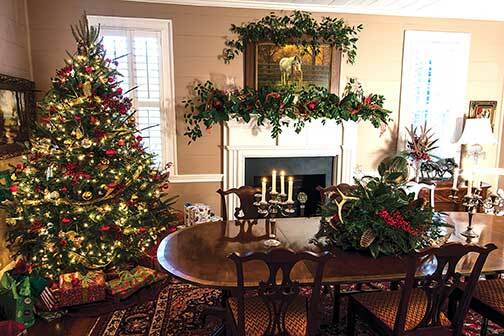 "I usually like to keep it simple, so the basket arrangements under the potting shed's windows have just Fraser fir and holly with a red ribbon," says Lee, a Clemson-certified master gardener. 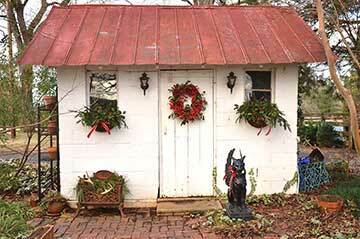 "I also cut a lot of native holly and cedar from trees in the back pasture for my Christmas arrangements. I get magnolia and boxwood from the yard. All these things were here long before we moved to Hunterfield in 1977." From the potting shed, it's just a short jog up the steps to the back porch, where Lee has arranged a holiday vignette on a tea cart. 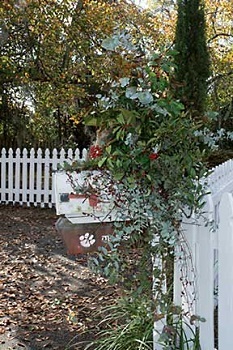 Its white cast iron offers an appealing setting for the red vase of variegated holly and winterberry she has set out, and in a little red and gold sleigh by the vase, Lee has tucked in nandina berry, boxwood, arborvitae fern, cotton and Fraser fir. As a final touch, she has added an ice-block light wrapped with red-plaid ribbon in the style of a gift package, with other holiday ribbons tying the vignette together. "Judicious use of artificial materials that complement your greens - like these plaid ribbons - can really make your arrangements pop," Lee notes. But she feels strongly that fresh greenery is the true star of the holiday show. Inside the early nineteenth-century farmhouse, the dining room gives Lee the widest scope for her decorative powers and displays everybody's favorite of her just-created holiday arrangements, the table centerpiece. Lee reflects, "With this centerpiece, I knew what I wanted - the shed deer antlers, which I picked up while walking on our property, and the turkey feathers. 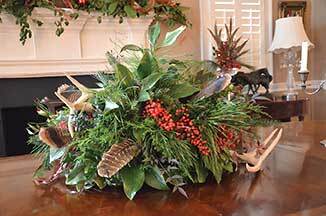 Everything's real: antlers, turkey feathers, nandina berries, nandina stems, magnolia, boxwood, pine, cedar and Fraser fir. 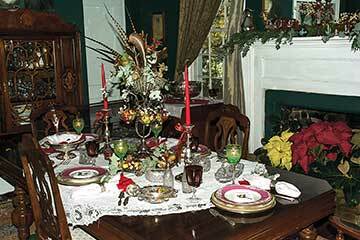 My sister Edith and I both worked on this arrangement, as well as the mantel. She agreed to help me decorate if I'd have family Christmas at my house!" City dwellers may believe they'll never be able to harvest enough material to emulate Nancy Lee's natural Christmas decorations, but with a little inventive thinking, they can give their homes the old-time feel natural greens afford. Dawn and Chuck Corley of Lexington, owners of in-town Corley Hall, prove it can be done. Dawn Corley explains, "In our yard, we've planted smilax, magnolia, camellia and eucalyptus just so we can decorate with them. For materials we don't grow on the property, we have our own private source." 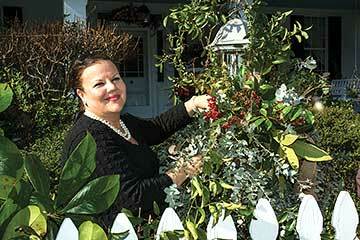 To keep holiday greenery looking freshly harvested, try conditioning the greens before arranging them, advises Nancy Lee. Here's how she does it. "After I cut my greens, as quickly as possible I submerge them in water in a big washtub. I soak them at least twenty-four hours, preferably forty-eight. When I finish soaking them, I cut all the stems again about half an inch up, just as I would with flowers, before I put them in an oasis or other water source in an arrangement. One other tip: If you keep your natural greens away from heat vents, they'll last longer." "We get them from a distant cousin, Rebekah, who lives in the area," Chuck Corley adds. "She cultivates the prettiest things just for use at the community Christmas party we host every December." 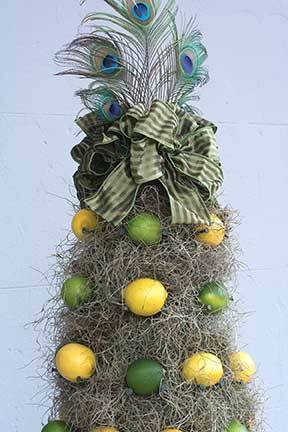 Another natural material the Corleys grow: citrus trees. Lemons, limes and oranges flourish in pots around their home, a two-story clapboard built in 1819, and the fruit is harvested for display on the house's vintage apple board and lemon board. These are located, respectively, over the front door and on a door to one side of the front porch. 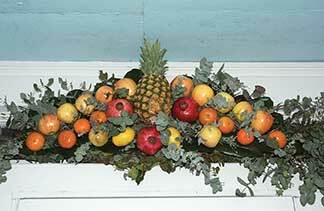 Says Chuck Corley, "We fill them both with fruit and greens, mainly eucalyptus and magnolia. The lemon board is just a square board with nails in it, and you push lemons onto it. Both boards date from the 1850s to the1870s. They were stacked under the house when I bought it." Corley Hall's front door opens to reveal a hall table on which rests an 18th-century family Bible. 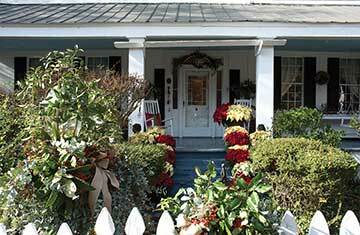 This two-hundred-year-old treasure is bedecked for the holidays with an encircling garland of smilax, cotton, Confederate roses and red nandina - just the sort of adornment that would have appealed to Chuck's Corley ancestors who once lived in the house. "We try to decorate in the style of the 1830s to suit the age of our home," says Dawn Corley, "and we start collecting decorating materials maybe a month ahead of time, things like rosehips and apples. But the bulk of the greenery we collect just before decorating. We also use feathers, a little ribbon, pinecones, pecans, berries, Confederate rose pods and Chinese lantern, all gathered from the yard - ours or a kind friend's. For instance, these buckeyes are grown about a block from here. A neighbor brings me a box of them every year." The Corleys' historic yard and garden nurture greenery planted by their ancestors of long ago, like the grapevines that have grown there since 1840. From them, Dawn Corley makes jars of grape jelly every year and gives them as Christmas gifts. She also cuts the grapevines and shapes them into wreaths. "And this two-story bush," Chuck Corley says, "is a four-petal camellia. We're told by Clemson Extension it's the oldest shrub in the Town of Lexington. It was planted probably in the 1820s, about when this house was built, and was imported from China. Dawn made Christmas wreaths one year from its tremendous greenish seed pods, which we often give away because we have so many." Initial impressions are important, as Dawn Corley knows, so she takes care that the front gate, mailbox and nearby lamppost reflect her sense of fun, as well as the Corleys' welcoming spirit. These decorations are enjoyable to make because they're uninhibited - whatever the plants do, they do, says Corley. The result is that they draw second looks from passersby and visitors. Peggy Culler-Hair also knows a thing or two about using natural materials to create displays that draw second - and maybe even third - looks. 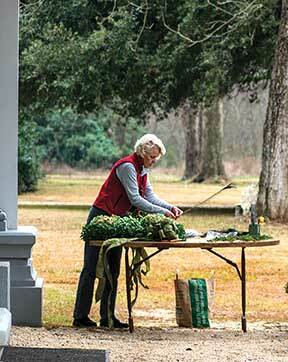 Every year since 2000, she's led the volunteer effort to adorn the exterior of Kensington Mansion in Eastover with greenery and flowers, using materials gathered from the surrounding acreage and her own yard. Visiting the beautiful antebellum plantation house owned and restored by International Paper and maintained in partnership with the Scarborough-Hamer Foundation has become a holiday tradition for many Midlands families. Unfortunately, it's one that they won't be able to enjoy this year. Last winter's late-season ice storm damaged the mansion, and ongoing repair work has derailed plans for the 2014 open house celebration. However, IP and foundation officials are hopeful that the mansion will be reopened to the public soon. "Typically, site manager Carl DuBose and I will go out and collect greenery right after Thanksgiving," says Culler-Hair. "We'll go first to the swamp to dig and cut palms and boxwood branches and other things." For the next two days, everything gets put together to create an authentic display reflective of what the mansion's antebellum period residents would have done at Christmastime. The winter-kitchen door wreath is always a challenge because it gets full sun, says Culler-Hair, so fresh greenery isn't an option for that display. Since her decorations are never the same for any two Christmases, Culler-Hair must come up with a different solution to this challenge every year. In 2013, she mounted deer antlers bedded on Spanish moss around the edges of a rattan tray. 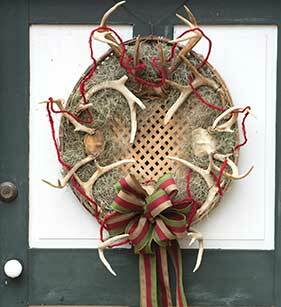 To the tray, she added a rustic bow and red wired-wool yarn that runs in and out of the antlers. Major efforts are reserved for the wreath on the house's front door and its accompanying arrangements. 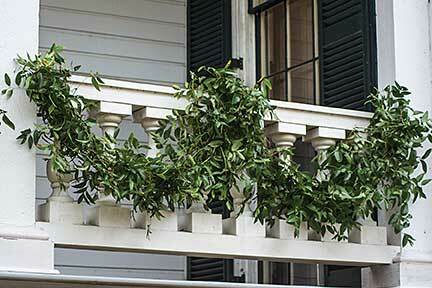 In 2013, Culler-Hair crafted a wreath featuring boxwood and Spanish moss as a base. Dried hydrangeas were placed atop the moss, punctuated by about thirty-five peacock feathers. Some of these hung at the bottom of the wreath, rather like a pendulum, with others fanning upwards from the wreath's bottom. A striped ribbon finished the creation. Complementary window treatments flanked the door with its wreath, and smilax vines from nearby woods served as garlands above the windows. Culler-Hair offers this tip for those who, like her, enjoy decorating with smilax: "When I use smilax in a door piece, I keep the root or cut-stem end in a hidden plastic bag with water in it so it stays hydrated and remains fresh longer." Of all her available greenery, she also advises, boxwood, magnolia, longleaf pine, redcedar and cypress keep fresh the longest. "Sometimes, I'll come by and freshen things during the season," she says "On occasion, local wildlife gets to the fruit in a decoration. A raccoon ate the pineapple one year, and we haven't used pineapple since!" Speaking for many who relish a natural Christmas, Nancy Lee muses, "I can see why people use artificial greens to decorate for the holidays, and nowadays you can buy artificial greens and berries that look so real. But to me there's nothing prettier than decorations made of natural materials out of your yard, your garden, your fields and woods." Columbia-based freelance writer Rosanne McDowell also serves as the resolution writer for the South Carolina Legislative Council.